Cranes held the 48-inch pipe in position before being fed through the pipe thruster and into the entry pit. 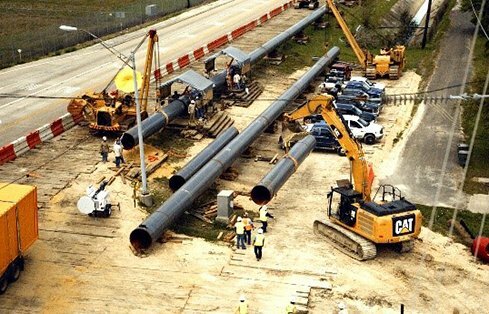 Prior experience with Direct Pipe technology led the GeoEngineers design team to recommend the switch from HDD to Direct Pipe, which significantly lowered hydraulic fracture risk. GeoEngineers recommended using a 48-inch steel pipe to house and protect the 30-inch HDPE waterline within. The pipe thruster in the entry pit fed the Direct Pipe underground. 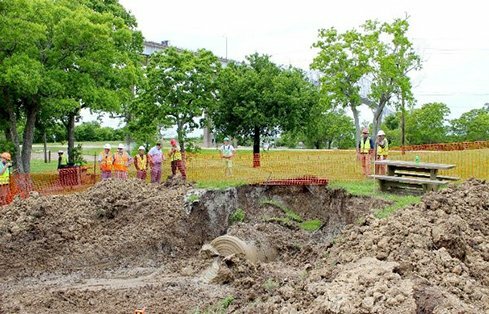 The tip of the 48-inch Microtunneling Boring Machine (MTBM) successfully emerges on the far side of the Sabine Neches waterway. The crossing was complicated by the proximity of the Sabine Neches levee, an active railroad, busy highway and residential area. The first US Army Corps of Engineers-approved Direct Pipe® installation under a US levee. 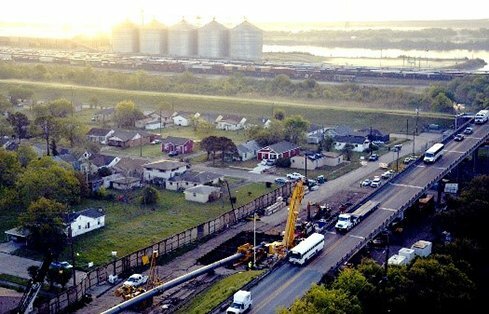 The City of Port Arthur, Texas needed to install a pipeline under the Sabine Neches Waterway to carry water from Port Arthur to an industrial facility 12 miles away in Louisiana. This crossing was complicated by the proximity of the Sabine Neches waterway hurricane flood protection levee, an active railroad, busy highway and residential area. 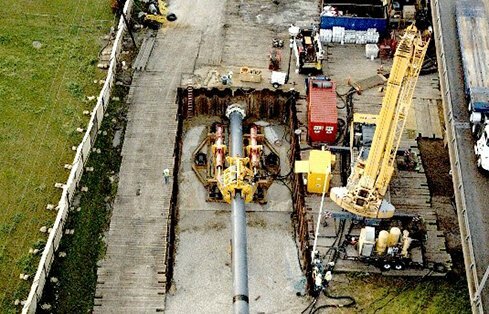 Originally conceived as a horizontal directional drilling (HDD) project, the GeoEngineers team instead recommended an innovative Direct Pipe® approach after the initial geotechnical exploration showed that HDD could create unsafe hydraulic fracturing of the soils under the levee. GeoEngineers’ team, led by Principal Jon Robison, submitted a design plan to the US Army Corps of Engineers (USACE) for approval, and received the first Direct Pipe permit for a crossing near a USACE-regulated levee. 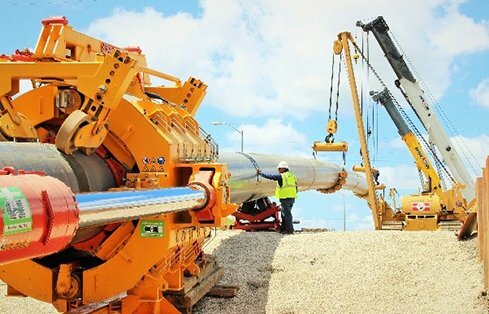 The client, Arceneaux Wilson & Cole, LLC (AWC), selected Strike Construction and Laney Directional Drilling Company as construction contractors to perform the Direct Pipe installation in accordance with GeoEngineers’ calculations and engineering design. Working with Direct Pipe manufacturer Herrenknecht, the design team developed a new method for estimating the downhole pressures prior to construction to facilitate successful USACE permitting. GeoEngineers and the project partners successfully completed the first Direct Pipe crossing of a USACE-regulated levee in the United States, and the longest Direct Pipe crossing in North America at the time. 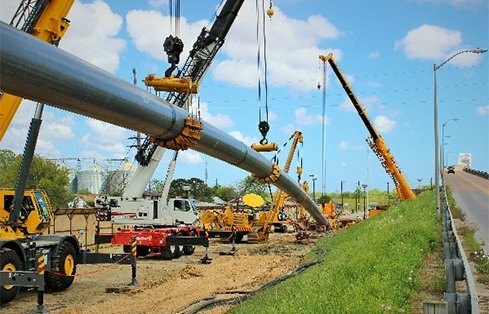 The 48-inch-diameter, 3,457-foot-long pipeline crossing of the Sabine Neches Waterway was completed in 32 days without any significant, unplanned delays. Finalist for the Tunneling & Underground Space Awards sponsored by New Civil Engineers magazine.